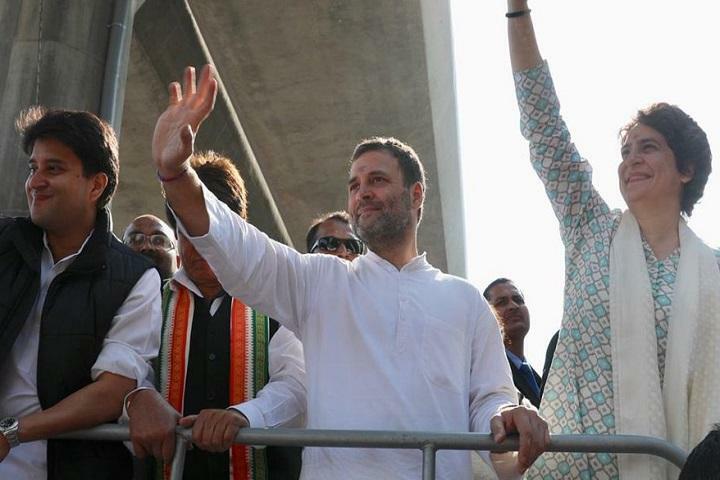 Congress President Rahul Gandhi and General Secretary Priyanka Gandhi did a roadshow in Uttar Pradesh's capital city Lucknow. The main purpose of this roadshow was to interact with the public face to face. Madhya Pradesh's Deputy Chief Minister Jyotiraditya Scindia also participated in the roadshow along with the President and GS of the Congress. During the roadshow, Rahul Gandhi made some strong allegations on the Prime Minister Shri Narendra Modi and said that the PM has looted 30,000 Crore of the states including Uttar Pradesh and the Air Force via Rafael deal. He also tried to tempt the UP's public by saying UP the heart of the Nation. The Hindu newspaper clearly states that Chowkidar (PM) has stolen public money and IAF's money. Through parallel negotiations and by removing the anti-corruption clause, Narendra Modi has helped Anil Ambani profit by ₹30,000Cr. The country's janitor has stolen money from the Uttar Pradesh and the rest of the states, the air force - Rahul Gandhi. We will not rest until we form a government that belongs to the youth, farmers and the marginalized. Our aim is to be in the Lok Sabha but to form the government of the Congress party in the Legislative Assembly. In Uttar Pradesh, we will bring the youth, poor and the government of the farmers - Rahul Gandhi. This is an ideological battle. On one hand, there is the Congress ideology of love, harmony, and brotherhood. On the other, there is the BJP-RSS ideology of dividing and weakening the nation. I'm very happy to be here. I express my gratitude for this reception filled with your love. I assure you that Congress party will not be on the back foot anymore - Rahul Gandhi. Uttar Pradesh has witnessed what Narendra Modi did for the last 5 years in the country. Youth are saying that Narendra Modi failed his promise to provide employment and benefited only people like Anil Ambani. UP's youth, farmers, Dalits and the poor, all want a progressive government. Everyone has failed on this front, and the only answer to this is to empower the grassroots leader - Rahul Gandhi. Narendra Modi said he wants to be a 'Chowkidar'. The truth has now surfaced that he conducted parallel negotiations in the Rafale deal. The clause that enabled investigation in case of corruption, was waived off by Mr. Mod. The hollow promises of Mr. Modi have come to light. Congress workers must fight this battle with issues that concern the youth, farmers. There is no dearth of issues. Congress party will fight to transform UP and the nation - Rahul Gandhi. I have given the responsibility of strengthening the Congress party in UP to Priyanka Gandhi and Jyotiraditya Scindia. The Congress party must form the govt in UP. In the assembly elections, the Congress party should form the government of Uttar Pradesh, it is the responsibility of all - Rahul Gandhi. For more and latest updates about the Politics, stay tuned to us.